Choose your keys and start wandering. To run the LÖVE-file you need the LÖVE-binary (https://love2d.org). Leaving a comment helps me find and play your game ;). EDIT: The Windows-build is untested. Please mention any problems with it in the comments. Oh man that game dev note had me in stitches. I had a lot of fun exploring, and the writing for the artifacts was really good. This is so good. I love the ambiance -- the whispering wind and snowy passages -- it really sells itself as a tundra. Neat game here. I love the expansive map! I really like the controls and screen size system. Great job! Probably the most solid take on a two button movement system I've seen yet. You can move around so fluidly even with this limitation! Rest of the game is nice but ultimately lacks a bit of interesting stuff to find beyond descriptions. Hope you'll expand upon it in the future! Btw, you can distribute your game as an executable when using LÖVE: https://www.love2d.org/wiki/Game_Distribution. Makes it a lot easier for folks! Thanks for the encouraging comments everyone! I know there ain't much by the way of gameplay, but I hope you all will get at least a few minutes of excitement and wonder out of it. @Clavus: Didn't realize I could build the windows executable on Linux. Been putting it off while thinking that I'll make one the next time I boot into windows. Thanks for making me review the link ;). I love the movement system. It's unlike anything I've seen before, and it really makes me feel like a ninja being able to pull off such cool maneuvers with just two buttons. I really games like this where the player just wanders about and discovers things about their surroundings. I had a fun time walking about. I didn't get all the treasure items, but I got maybe 10ish. Anyway, the movement was amazing. It felt extremely fluid, and it was an interesting challenge to move about. Also, I liked the humor in this game. I didn't get to see every joke, but I did like the ones that I saw. My critiques for this game would be focused on the graphics. I really liked the player animations, however, I felt that the game as a whole wasn't as colorful as I would have liked. The player was red/black. The background was gray, and the snow appeared to be white with a reddish tint. The only color which really stood out in this game was the blue of the treasure. I really wish that there were some more colors along the way to make the environment look more interesting. I really liked letting the player choose their own left/right keys, that was a nice touch. The use of momentum through climbing was pretty cool, too. 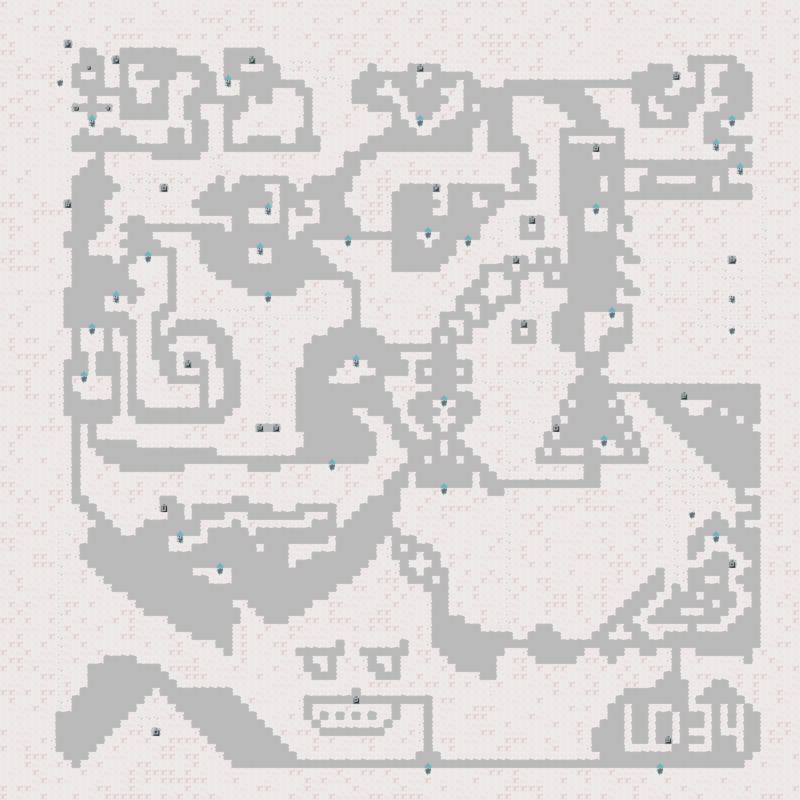 A nice, mellow explorer platformer, well done! Wow! I love the control-setting mechanic at the start. Throughout the game I slowly got better at making various jumps with the climbing thing. Probably half of the hour or so I spent playing this was just me trying to find the last box, which ended up being the one in the VERY top left corner that I hadn't spotted at first. Clever entry! The mechanics seem really simple at first, but after playing a few minutes you realize you have more freedom of movement than you thought, thanks to momentum. The settings at the beginning are genius, and I also liked the character's animations. That being said, I didn't feel motivated enough to spend hours looking for all the treasures. Apart from that, the mechanics are very well thought and tuned, wall collisions and inertia are a bit frustrating at times, but in general it’s very fun to play. I suggest having a mini-map, or a radar, or just a simple arrow at the edge of the screen indicating the general direction of the nearest artifact. The writing style is also pleasant, and using Löve makes the game Linux-friendly, so thanks for that, too. Good job. felt very retro and I liked the little descriptions of items. "This game indicates it was made for version '0.9.2' of LOVE. It may not be compatible with the running version(0.10.0)"